Some time in the early part of 1892 a young singer who had been engaged for the Metropolitan opera by Abbey, Schoeffel and Grau, and who had made a conspicuous success in opera houses abroad where Schumann-Heink was already a favorite, came to America for fame and fortune and found them in Minneapolis, to which city she had been sent by order of a physician. She was what is known "run down in health" and Minneapolis was chosen on account of its unusual climate which had been guaranteed to make people with delicate throats well. The singer was Anna Eugenie Schoen-René. Although her stay was originally planned for a few weeks only, the Northern climate was so salubrious that she determined to make her home in Minneapolis. Mme. Schoen-René was a remarkable artist in every sense of the word, but the chronic state of asthma made it impossible for her to continue on the opera stage or concert boards, so she turned her attention to teaching. She was a pupil of the old García and had been accredited an authorized representative and it was not long before she became the most talked of singing teacher of the Northwest, and pupils from all parts of the country went to study with her. While the air in Minneapolis was exceedingly beneficial, yet the artists atmosphere was extremely thin. In fact, it is truer to say there was none. Schoen-René, accustomed to an esthetic environment and the society of musicians, felt as lost musically as if she had been placed on the Desert of Sahara and she proceeded practically to initiate the Minneapolitans into appreciating good music by given a series of concerts which she presented the most famous artists. In the subsequent eighteen years she became one of the most active managers in the United States, but without neglecting her studio or filching time from her class. She contrived to arrange the concerts in her leisure hours and in due course Minneapolis heard, under her direction, Seidl and his orchestra, he Chicago Symphony (then the Thomas Orchestra); in fact, all the great organizations which were traveling during those years. Melba, Schumann-Heink, Alice Neilsen, Campanini, Plançon, Scotti, Caruso, Godowsky, Fremstad, Lhevinne, Nordica, Paderewsky, Calvé, Harold Bauer, The Metropolian Opera Company, etc., were all heard under her management. Through her extraordinary energy and enterprise, the public on Minneapolis became appreciative of good music and her concerts were the most successful ever offered in the Northwest; Schoen-René had become a vital force, the greatest factor in creating and building the music of the great city. Her concert course was the forerunner of the splendid Minneapolis Orchestra, which is now the city's chief last and artistic pride. Each year from October till the following May, she devoted herself to her class and concert course, then she sailed away for her annual summer visit to the Garcías (Manuel and Pauline Viardot). For twenty-five summers she aws a pupil of Manuel García. She was assistant during the summer months to Mme. Viardot for both the famous brother and sister thoroughly realized her genius for teaching and her command of what is known as the García method. They announced Schoen-René as the absolute representative and prophesied that her's would be a wonderfully successful career. So much did they appreciate her work that they called her pupils their artistic grandchildren. Mme. Schoen-René took her last lesson of García when he was ninety-nine years old. She describes him as being mentally alert and as powerful in his teaching as in the prime of life. Of course, when he walked, he was very much bent, but when he sat at the piano he straightened up and had as much fire and enthusiasm as if he had been a young teacher. She said it was marvelous the hold the had upon his pupils and how he could immediately detect the fault in placement and almost as immediately correct it. Pauline Viardot was in Mme. Schoen-René's experience almost as compelling as her brother. Preceding the study with the Garcías, Mme. Schoen-René had been a pupil of the elder Lamperti in Milan. She also coached during her vacation with Mme. Clara Schumann, with whom she studied the Schumann songs. Another great experience was her acquaintance with Brahms, which extended over several years during which she studied his songs with him and subsequently became known as one the Brahms interpreters. She said it was marvelous the hold he had on his pupils and how he could immediately detect the fault in placement and almost immediately correct it. Unlike some of her colleagues, Mme. Schoen-René early discovered that to be a real success over here, one should became an American citizen; she did not wait to be urged, but when opportunity offered she immediately secured her first papers, and as quickly as the second could be obtained procured these also. All this happened some twenty-two years ago. 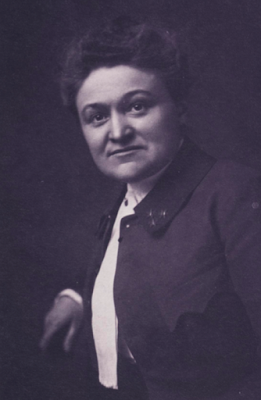 About 1910 she concluded that certain pupils were about due for operatic experience, which could not be had in this country, and with several students, including the remarkable tenor George Meader, she journeyed to Europe, where she at once found recognition. Students went from America on purpose to be with the woman, who for many years, had been the leading singing teacher of Minneapolis. It was not difficult for her to have the entree, nor the hearing in the opera houses, since her family was extremely well known in the Rhenish district; her mother having been a French woman and her father a Rheinlander. It was from her studio abroad that she launched George Meader, whose Scandinavian and Swiss successes excited enormous interning and who was received also with extraordinary favor in Munich and Dresden and sensationally acclaimed. His first lesson was taken from Schoen-René in Minneapolis when he was nine years old; his boy voice being of rare beauty. Unlike most prodigies, Mr. Meader became a great artist for either oratorio, opera or song recital. He is still studying with Schoen-René, although now, at the age of thirty-two, he has enjoyed such triumphs as fall to the lot of few artists. Schoen-René has remarkable gifts, is a very fine musician, a cultured woman and has extraordinary talent for teaching the García method. Circumstances connected with her personal affairs have brought her recently to America for she has large interests in the Northwest and Chicago. Since war was declared, she was unable to leave battle-scarred Europe, but a few weeks ago she was handed her passport as an American citizen. Having now taken permanent residence in her adopted country, she will continue the good work she did in her studio abroad. She says that that loveliest voices come from the Western States and as to pupils she likes the serious purposeful students. Schoen-René will have plenty of opportunity of carrying out her ideas and ideals for the students in America, who during the last four years, have desired to study with her and who could not go abroad, have been extremely numerous. That Schoen-René is of the world's really great vocal teachers is genuinely acknowledged. Mme. Schoen-René inaugurated also the Musical Department of the Minneapolis University, under whose auspices she gave many notable concerts. This continued for a period of twenty years. She also conducted choruses of mixed voices and glee clubs, all of which she founded. The great success of the University's Musical Faculty is attributed to the work she did in its creating and building. She will open her studios in New York about Sept. 15. — The Musical Leader, August 28, 1919: 203. Note: It was Pauline Viardot-García, rather than Manuel García, with whom Madam Schoen-René was a student for "twenty-five summers," Schoen-René meeting the father of voice science for the first time in 1896 and studying with him until his death in 1906.